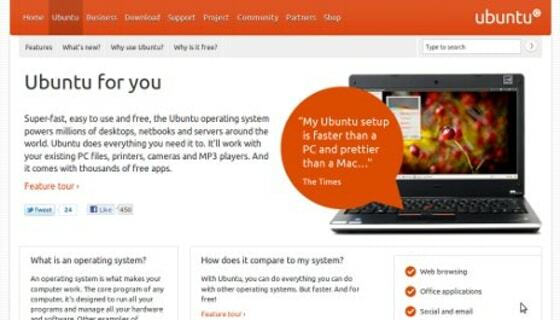 We all know Ubuntu is great, but we want even more people to know just how great. With this in mind, we thought we’d give the visitors of ubuntu.com the tools to spread the word about Ubuntu. As of today, you can see Tweet and Like buttons on some of the key pages of the website, such as Ubuntu for you, the Features pages, or the Download page. This is the first step towards something bigger. In the pipeline are the introduction of more ways of sharing the Ubuntu message with friends, family and (why not?) your entire social network. For now, we’ve focused on the two most popular services. 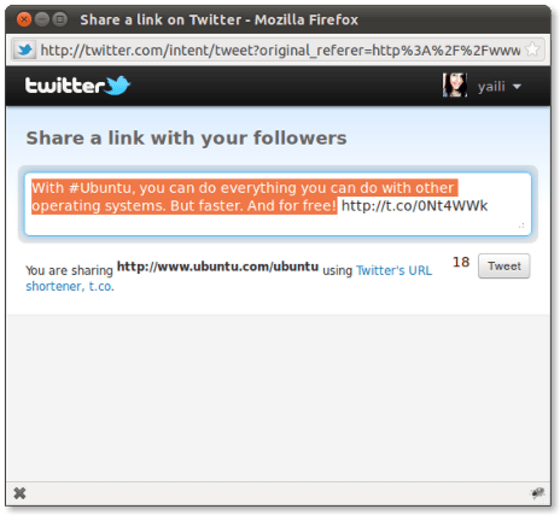 Sharing your favourite pages of the Ubuntu website on Twitter is a breeze. Before tweeting, you can customise your message too. We’d love to get your feedback, hear your suggestions, and know your ideas on how you can tell the world just how lovely Ubuntu is. As an Ubuntu lover and active member of the community, what tools do you think would help you and be most valuable in sharing your experience of Ubuntu? Finally, if you love Ubuntu, help us spread the word: visit ubuntu.com and share those links with as many people as you can!